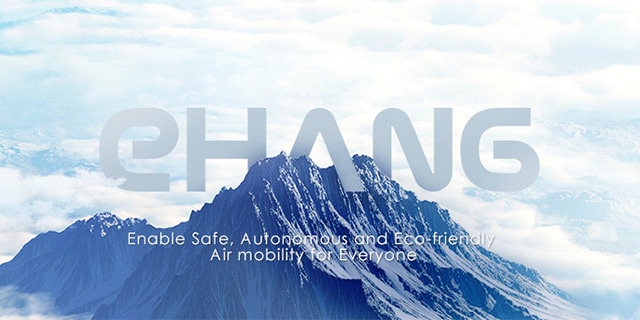 Established in 2014, EHang is an intelligent autonomous aerial vehicle company with integrated capacities of R&D, manufacturing, sales and services, headquartering in Guangzhou, China. EHang is awarded by the international business magazine Fast Company as one of the “Most Innovative Companies” and ranked into the top 3 companies across the world’s UAV industry. With the mission of “let humankind fly freely like a bird”, EHang provides customers from various industries with user-friendly, safe, intelligent and efficient autonomous aerial vehicles (AAV) and various solutions, including urban air mobility solutions, smart city management solutions, aerial media solutions, and other commercial solutions. As the forerunner of cutting-edge UAV technologies and application models in the global civil drone industry, EHang consistently explores the boundaries of the sky to make the flight benefit our better life in the smart city. The very existence of EHang is to bring in revolutions on sky and flying for humankind, to transform the time, space and method of using aerial vehicles, to provide easy and convenient access to aerial vehicles for anyone at anytime and anywhere, to profoundly change people’s living styles, and to make a difference to human history of the future century. We firmly believe that EHang will become the most influential global leader of the intelligent aerial vehicle industry in the near future. We will spare no efforts to invest in independent research and development, extensive cooperation and open platforms, so as to win the largest number of direct or indirect users and the championship position of technology innovation, market share and brand value for the company across the world. The innovation and growth of EHang root in the great importance it attaches to its customers. When something went wrong with the GhostDrone in the early days, the CEO publicized his own mobile number, and dealt with customer’s questions in person without rest in a 24-hour basis. All members of EHang have broad visions, unite together and strive for success through close teamwork. In the early days of EHang’s establishment, the condition was so poor that there was not even a formal office, colleagues of various ages, personalities and backgrounds united together and made joint efforts to develop the company without distinguishing “your business, my business”, and eventually pioneered a road forward for EHang’s products and businesses. The establishment of EHang is the process of transformation and innovation. Dare to dream, dare to transcend and break conventional thinking, and dare to act and innovate. The birth of GhostDrone and EHang 184 is the result of thinking out of box, doing what others dare not to do, and most importantly, taking the courageous first step to turn ideas into reality. Facts are problems and realities we must confront, and truths are the essence and laws we must explore. Not equipped with adequate technologies and methods, we may be naïve at the beginning. However, it is by facing up to difficulties, competitions and our own shortages and by ceaseless explorations and attempts that we eventually master more profound technologies, theories and laws, which in turn improve our problem-solving ability, thus shaping a virtuous cycle.